Quite an interesting and controversial evening last night as Harper Bazaar UK hosted a private viewing and talk regarding Louis Vuitton Series 3 Exhibit at The Strand. The evening started with a cocktail reception with lots of Veuve Clicquot and canapes, although I must say I barely saw any of the latter. Bazaar's editor-in-chief Justine Picardie and Fashion Director Avril May joined us for a talk about Luxury in the Digital Era. Considering we leave in a world ruled by the internet Ms Picardie didn't fail to surprise me as she continued to detract social media. I understand her point of view when shay says that 'digital cannot replace real experience' but then again can we obviate the fact that most of us get to live unattainable experiences thanks to the internet? If it wasn't because of it most of the public could not experience a catwalk show, for example. Street Style was also taken to discussion. Ms Picardie highlighted Anna dello Russo as the queen of street style and I think we all agree on that one. However, she also pointed out that street style is no longer a reality but rather a commercial transaction. 'You see these girls pretending to be on their phone, parading before the show's entrance until they get photographed and then you see them sitting on the 5th row of a catwalk'. Ok, streetstyle has become indeed something very different from what it used to be. But did we create that or did the industry do it? Photographers only shot celebrities or big influencers these days and therefore your only chance to be noticeable is to be as creative as possible. More over, does it matter where you sit on a catwalk show? We go to shows because we want to experience what it's like and because we want to see what will be coming up next season. We you sit should not matter. Of course we would all love to sit first row but sadly that only happens to the renown people. That is why I could understand why those 5th-rowers would like at least to get some Hollywood-fame before the show. All in all very tricky topics that left many people with more questions rather than answers! The event continued with a private viewing of #LVSeries3, a psychedelic experience that took us through the process and thought towards Nicholas Ghesquiere's AW15 Collection. Five rooms showing the history of Louis Vuitton from 150 years ago until last AW15 collection. A beautiful story about how the house works from design creation to production and until the clothes are on the catwalk and later on in your wardrobe. let us explore LV designer’s mind from a full-length screen: muses, memories and new shapes form around, with the heritage trunk at the core of it all. Watch out, you might get a bit dizzy if you stay too long! The famous LV monogram was created among dinner table. showcased the catwalk show that took place at the Louis Vuitton Foundation in Paris last march. showed us how the creativity of the designer becomes a reality through the artisan's touch and the precision of the laser. Actual french artisans where set at the exhibition to provide us with a real experience of how a clutch gets made at LV. It takes 13 hours to make one single clutch! aka 'blinding room' where the LV key pieces from previous collections as well as AW15 stand out from a complete blank space; and the walk-in-wardrobe, where you could see how the piece beautiful garments would look on a women's closet. 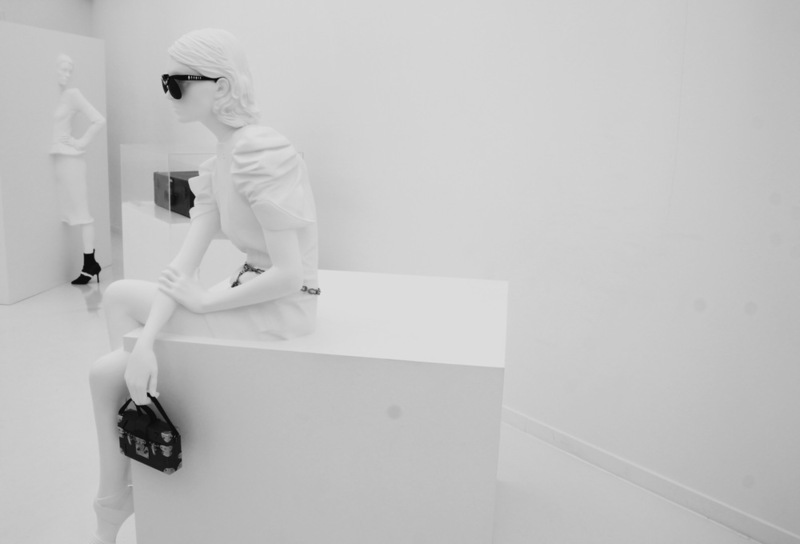 A stunning exhibit that transported you to the luxurious style of the Louis Vuitton house. Don't miss it!